Does anyone want my grandparents stuff? We are often contacted by people who, through the death of an elderly loved one, are now faced with trying to unload their familes home contents. If you have never gone through this process, it’s a real eye opener, especially for older members of the family tasked with this chore. We all have fond memories of growing up and playing at grandmas house and the love and care that she put into the house, along with all the lovely things inside it. Unfortunately, the value of things has changed dramatically over the past few years. Things that were in high regard and value in the past are no longer sought after or even wanted today. Things like porcelin dolls, china, figureenes and such are just viewed as needless clutter today. Most of the people who contact us, begin by telling us they have a variety of items ranging from kitchen sets, living room sets, bedroom sets, china cabinets filled with all kinds of things, and believe that buyers will want to flock to their home for a chance to buy their contents. Sadly, that’s just not reality today. Things have really changed over the last few years. Items that people thought were valuable years ago, such as collectable figurines or china cabinets filled with plates and glassware are no longer in style. Furniture that is still functional but is 20 years old is just not in style or in demand today. We have found that 50 is the magic age. People over the age of 50 already have many of the things that people want to sell and do not want any more of it. People under age 50 simply do not have interest in many of the things that people want to sell. It all boils down to style, age, condition and desirability. We always tell people that it does not matter what you paid for it…something is only worth what someone else is willing to pay for it. This is part of a continuing series of helpful articles from Joe Santoro and Nick Santoro of Personal Property Managers to assist you in home downsizing, content liquidation and full service discount real estate services. Personal Property Managers services clients in New Jersey and Pennsylvania. Caregivers and executors of estates quickly learn the hard truth that others in their 50s and 60s need to know: Nobody wants the prized possessions of your parents — not even you or your kids. Many boomers and Gen X’ers charged with disposing the family heirlooms, it seems, are unprepared for the reality and unwilling to face it. Let’s face it, how many young people do you know that are picking out formal china patterns or want former collectable antiques anymore? Joe Santoro, says that at least a half dozen times a week, families come to us and say: ‘What do we do with all this stuff?’” The answer: do you know of anyone who may want it, because there is little to no resale value in items such as furniture that is 20 plus years old; and good luck trying to get a charity or thrift store to take your 30 year old bedroom set, dining room set and couches. Dining room tables and chairs, end tables and armoires have become furniture non grata. Antiques are antiquated. Old mahogany stuff from your great aunt’s house is basically worthless, says Nick Santoro. What about all the stuff you see on TV shows? On PBS’s Antiques Roadshow, for example, prices for certain types of period furniture have dropped so much that some episode reruns note current, lower estimated appraisals. And if you’re thinking your grown children will gladly accept your parents’ items, if only for sentimental reasons, you’re likely in for an unpleasant surprise. Young couples starting out don’t want the same things people used to have according to Joe Santoro, and in fact, they often don’t want anything from grandma’s house. In fact, we have found that around age 50 is the dividing line. People over 50 already have lots of the same stuff that people now want to get rid off and don't want anymore of it and would like to downsize themselves too. People under the age of 50 simple don't want older stuff. We now live in the disposable age. Many things, like furniture are must less costly today, so younger people would just rather buy new things and then after about 7 or 8 years simply get rid of it and get newer items all over again, to keep up with changing styles and taste. Joe points out that this is an Ikea and Target generation. They live minimally, much more so than the boomers. They don’t have the emotional connection to things that earlier generations did. They are more mobile. So they don’t want a lot of heavy stuff dragging down a move across country for a new opportunity. Additionally, Nick points out that you can pretty much forget about interesting your grown kids in the books that lined their grandparents’ shelves for decades. If you’re lucky, you might find buyers for some books by having a garage sale, but be prepared to sell a whole box of books for $3.00. In fact, many local libraries will not even take books anymore and certainly not old encyclopedias. Most antiques dealers (if you can even find one) and auction houses have little appetite for your parents’ stuff, either. That’s because their customers generally aren’t interested. Even charities like Salvation Army and Goodwill frequently reject donations of home furnishings, we can sadly report from our own personal experience. 1. Give yourself plenty of time to find takers, if you can. “We tell people: The longer you have to sell something, the more money you’re going to make, of course, this could mean cluttering up your basement, attic or living room with tables, lamps and the like until you finally locate interested parties. Additionally, this could take quite some time and effort to accomplish. 2. 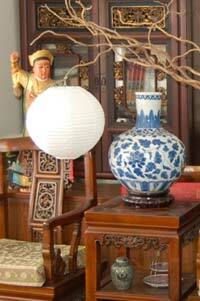 Do an online search to see whether there’s a market for your parents’ art, furniture, china or crystal. 3. Get the jewelry appraised. It’s possible that a necklace, ring or brooch has value and could be sold. 4. Look for a nearby consignment shop that might take some items. Again, this takes a lot of time and effort, and don’t forget about the cost and logistic of removing and transporting the contents. None of this is easy. 5. See if someone locally could use what you inherited. Giving stuff away may make you feel better, because trying to sell items takes patience and effort. 6. But perhaps the best advice is: Prepare for disappointment. “For the first time in history of the world, two generations are downsizing simultaneously,” says Joe Santoro, talking about the boomers’ parents and the boomers themselves. The bottom line is that the younger adult generations simply want something different from their parents. They prefer newer, more contemporary styles and do not want lots of needless clutter. The good news is that we can help clean-out your house, help downsize your family home and liquidate contents that are saleable and in demand. We offer on-site estate sale services if there is sufficient quantity and quality. We can remove contents and sell them via our array of proprietary resources, again, if they are in demand and of value. And, lastly we can remove and dispose of unwanted and unsaleable contents. For more insights, tips and videos please visit our Resource Page in the About us tab.